1/32 Revell F-4E - What could possibly go wrong! My name is Richie and I love the smell of burnt kerosene. a - an over-ambitious build programme that would require the invention of time travel to complete my collection. b - a lack of resistance to nice new shiny decals (that adds to the first issue). c - an inability to recognise that OOB is just fine in most cases. d - the view that 50 Shades of Grey is the epitome of panel weathering. I am also an Optimistic 80%er. By that I mean I will endeavour to add detail/changes when it makes a noticeable difference but lack of skills / patience may ultimately limit my AMS ambition to a level of â€˜Good Enough'. And so to the challenge, a 1/32 Revell F-4E. As if first night nerves wasn't enough, it will also be the first time I have used a lot of this stuff and just to make it more interesting I'm going to put her in flight and light her up. This may get ugly. For those who like their builds quick and dirty, sorry but this is going to be a slow burn (but probably dirty!). Very happy for comments, suggestions, advice etc but don't be offended if I do something different or not quite true to life, as they say art is in the eye of the beholder. Oh, and as a cautionary tale to others I will also be keeping an catalogue of errors of all the mistakes I make. Lets hope it stays in double figures! Hi Ritchie and welcome ! You got a lot of nice stuff to get this model to the best standards ! 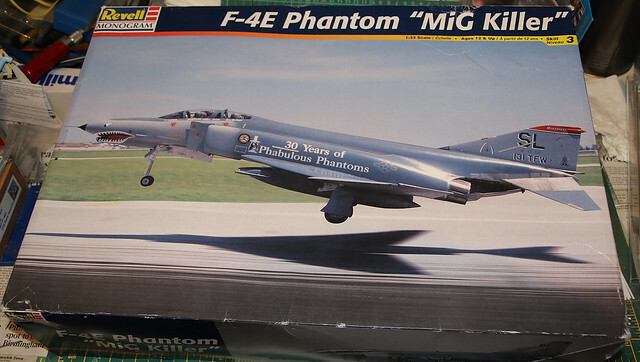 Good luck with this build, i will follow it with interest as i have 2 Revell F-4E cousins (a F and a G) in the stash and i'd be glad to see how it behaves. Nice to see you start a build thread, Richie. It's the best way to learn how to improve, in my opinion. Looking forward to following your progress! Go Richie! Looking forward to the build as the F4 is one of my faves. greetings from Brazil mate!! rockn'roll!!!! Thanks for stopping by Chaps, this will certainly be a learning experience for me! I've started removing parts from the trees just to get a feel for the job in hand and the first thing that springs to mind is how big this thing is going to be when (note the positive slant) its finished. I normally have a go a 1/48 so this is my largest model to date. This may prove interesting when we come onto the in flight display aspects later. As I rarely follow the instructions to the letter I've sort of tinkered with a number of items just to get a feel for what I'be let myself in for. Firstly the Legend cockpit which looks ok to the untrained eye but apparently relies on you having the deduction powers of Sherlock Holmes as it comes with no instructions other than a small bit on how to fit the PE. The sidewalls look very nice so I cut them out and then had to figure out how they fit in the model. I also cut out the coming to fit the resin part. Possible Error #1 - I have no idea if its the size of the resin parts of my placing of the sidewalls at the top of the cockpit sill, however there is a gap at the bottom of the sidewalls before they meet the side consoles. No big deal as I will put some card filler in but I may have to add extra detail to make it less obvious. Alternatively I could just leave as is as I'm shutting the canopy anyway but the little AMS voice in my head is damn persistent. Ok question time. When looking at what loadout to give this bird I checked out the fit of the centreline tank. Now how do you suppose Revell expect you to glue this baby on when the large lump in the middle in no way conforms to the drop tank pylon? Anyone had a go at addressing this particular conundrum? Looking forward to this build. That said, the tank you're showing is not used on the F-4E. Use the other 600 Gal "Hi-Speed" tank that is also included. hell yeah man, get after it! Welcome aboard and looking forward to following your progress. Surely is going to be one interesting thread. that tank is used on a Viet Nam era F-4E. The pylon for the tank is too narrow. In real life area on the bottom of the fuelage is covered by the sides of the pylon. One solution is to remove the pylon on the tank, glue only the front and rear ends of the pylon and put a couple spreaders between the halves to widen the pylon and the reattach it to the tank. 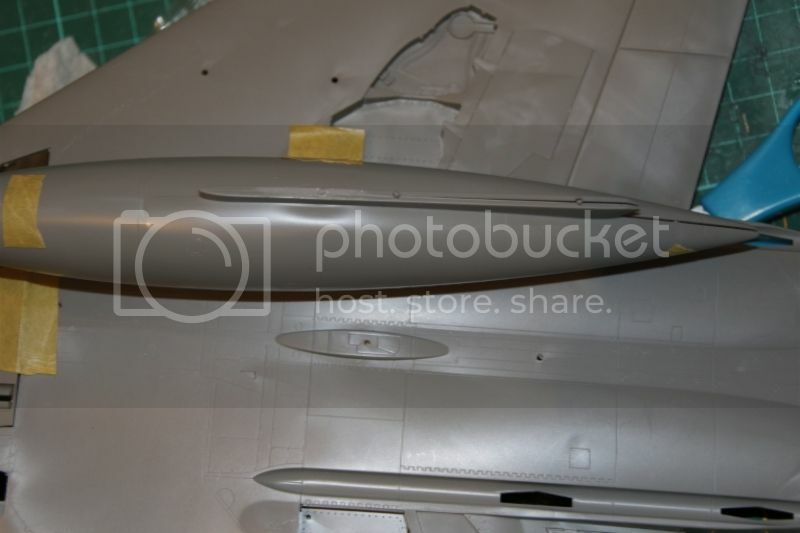 two things that ned to be corrected on the kit are the length of the intakes(they need to be moved back about 1/8 inch and for a Viet Nam E you have to replace the outer wing panel with an unslatted version like the one on their RF-4 and not use the slats on the main wing. Good luck with the build. I'm aiming to build a mid to late 70's USAFE bird. From what I've looked at so far the ones I'm interested in have slats but I'm not sure about the belly strap, Any idea when they would have been implemented? I've seen photos with the early tank and the later 600 Gal one but this seems to have been fitted more when they had the wrap-around schemes. Bruce - Many thanks for the info,I like the idea of modifying the pylon to fit. I'll see what spreading it does to the overall shape but that might also give it more stability. I'm using GT Resin intakes which should resolve the intake length issue. I'm going to have a go at displaying her in flight which means pilots (unless its a drone of course - now there's a thought!). Revell have thoughtfully not included any so I've borrowed a Tamiya figure and acquired one from Master Details. 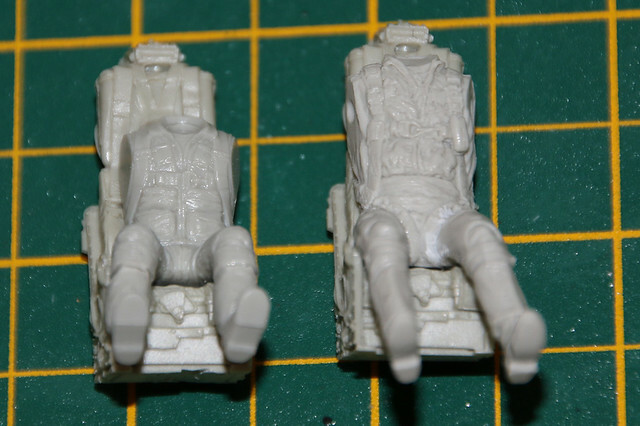 As usual, and particularly with Resin cockpits, the pilots rarely fit and some form of surgery is required. This is rarely cosmetic and would probably affect their med cat. Thats when I noticed that I appear to have pilots who fit both ends of the human spectrum. 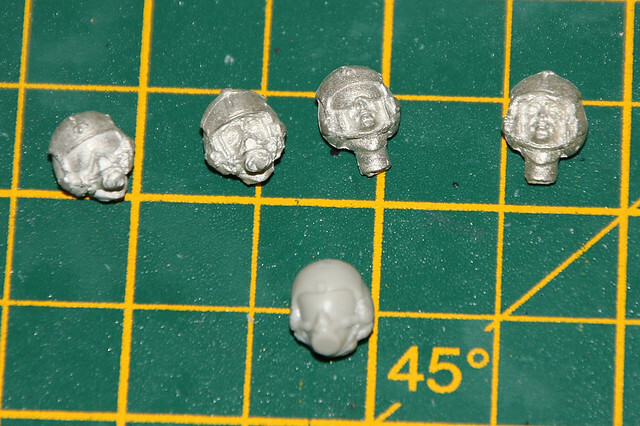 However, According to my very rough calculations the Tamiya pilot is about 1.66M tall, the Master Details pilot is about 1.9M. This could be distracting if one is head and shoulders (literally) above the other. Time for some serious modifications that would rival that of a photo-shopped celebrity! Good luck Ritchie - I look forward to watching your progress. 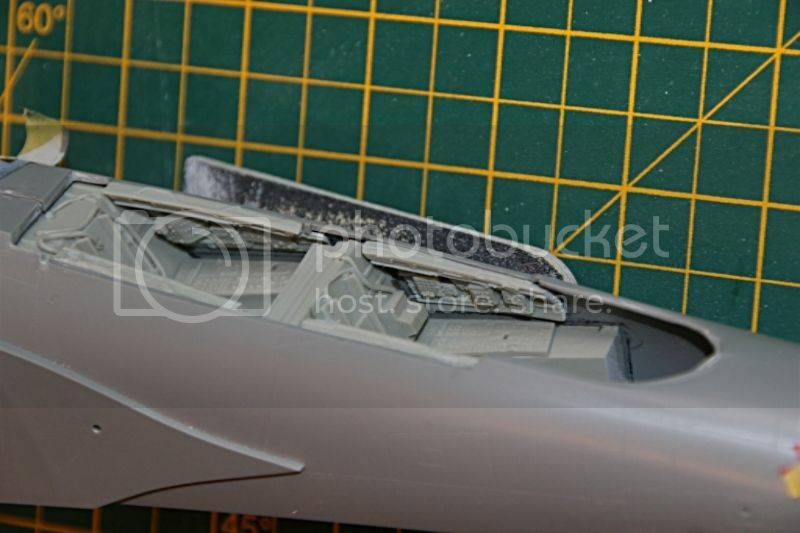 a further note on spreading the pylon... you will probably have to cut down the width of the mounting on the fuselage bottom because the plyon can't be spread that much.